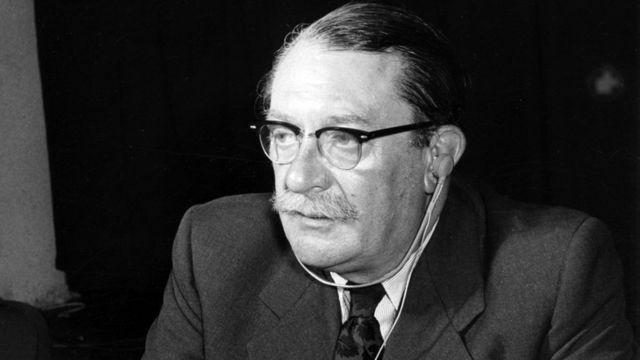 Gilbert Harding (5 June 1907 – 16 November 1960) was an English journalist and radio and television personality. His many careers included schoolmaster, journalist, policeman, disc-jockey, actor, interviewer and television presenter. He also appeared in several films, sometimes in character parts but usually as himself - for example in Expresso Bongo, 1959. Harding had a sizeable role alongside John Mills in the 1952 film The Gentle Gunman and narrated the introduction to the film Pacific Destiny, 1956. He also made a couple of comedy records in the 1950s. Gilbert Charles Harding was born in Hereford where his parents were employed as "master" and "matron" of the city's workhouse. His father, also called Gilbert Harding, died in 1911 aged 30 following an appendicitis operation and so his mother placed their son into the care of the Royal Orphanage of Wolverhampton. Harding's education continued at Queens' College, Cambridge, after which he took jobs teaching English in Canada and France. He returned to Britain and worked as a policeman in Bradford, before taking a position as The Times correspondent in Cyprus. In 1936 he again returned to Britain and began a long-term career with the BBC. He was a regular on BBC Radio's Twenty Questions and was voted Personality of the Year in the National Radio Awards of 1953-4. Harding regularly appeared on the BBC television panel game What's My Line? as a panellist, having been the presenter of the very first episode in 1951. Harding was notorious for his irascibility and was at one time characterised in the tabloid press as "the rudest man in Britain". His fame sprang from an inability to suffer fools gladly, and many 1950s TV viewers watched What's My Line? less for the quiz elements than for the chance of a live Harding outburst. An incident on an early broadcast started this trend when Harding became annoyed with a contestant and told the contestant that he was getting bored with him. Harding's rudeness off screen was also commented upon; at a wedding reception at which a guest remarked that the bride and groom would make an ideal couple. Harding replied "You should know, you've slept with both of them". He became increasingly unable to move anywhere in public without being accosted by adoring viewers. On one occasion he asked a mother with two children if "your children are crippled", because they had stayed seated on a railway bench. Freeman publicly expressed regret about this line of questioning; its emphasis on Harding's "closeness" to his mother has since been seen by at least one commentator as a tactless attempt to expose his homosexuality, though the viewing public did not become aware of it, and he was seen as merely a lonely bachelor. Harding kept his sexuality secret because male homosexual behaviour was a criminal offence in the UK. Harding also admitted in the programme that his bad manners and temper were "indefensible". "[I'm] profoundly lonely," he stated, later adding, "I would very much like to be dead." Harding died a few weeks after the 'Face to Face' programme was broadcast, collapsing outside Broadcasting House as he was about to climb into a taxi. The cause was an asthma attack. He was 53 years old. Harding was buried in St. Mary's Roman Catholic Cemetery, Kensal Green, west London. Behind Harding's gruff exterior there was a lonely and complex man who constantly donated to charity, visited the sick and helped many in need. But such details, in conflict with the public image, became public only after his death. In 1979 radio presenter Owen Spencer-Thomas on BBC Radio London's Gilbert Harding described him as "enigmatic ... bad-tempered and rude, yet his friends counted him as one of the kindest, and most generous." The Face to Face interview was rebroadcast on BBC Four on 18 October 2005, following a repeated episode of What's My Line?. It was also broadcast in part on the BBC Four series 'Talk at the BBC.' A three-hour programme "The Rudest Man in Britain" was broadcast on BBC Radio 4 Extra in 2014 and has been repeated several times. It included interviews with people who knew and worked with him and explored Harding's life, personality, sexuality and influence in a non-judgemental way. It included the Face to Face interview in full as well as episodes of programmes where Gilbert was either Chairman or panel member. It ended with Stephen Wyatt's play Dr Brighton and Mr Harding. ^ Denis William Brogan (September 2004). "Harding, Gilbert Charles (1907–1960), radio and television broadcaster". Oxford Dictionary of National Biography. Oxford University Press. ISBN 978-0-198-61412-8. Retrieved 26 May 2018. ^ "The Workhouse, the story of an institution ..." Peter Higginbotham. Retrieved 26 May 2018. ^ "Index entry". FreeBMD. ONS. Retrieved 26 May 2018. ^ Harding, Gilbert, Along my Line, Autobiography, Putnam, London, 1953, chapter 2. ^ Kynaston, David (2009). Family Britain 1951-7. London: Bloomsbury. p. 18. ISBN 9780747583851. ^ Kynaston, David (2009). Family Britain 1951-7. London: Bloomsbury. p. 354. ISBN 9780747583851. ^ According to the booklet for the Face to Face Region 2 DVD set (p.27) the interview with Harding was recorded on 3 July 1960 and broadcast on 18 September 1960. ^ "Index entry". FreeBMD. ONS. Retrieved 5 June 2018. ^ Andrew Roberts "Harding, Gilbert (1907–1960)", BFI screen online website. Accessed URL 29 May 2010. ^ "Gilbert Harding". Find A Grave. Retrieved 21 March 2012. ^ Stephen Bourne "Harding, Gilbert", The Museum of Broadcast Communications website. URL retrieved 29 March 2010. Russ J. Graham, "Gilbert Harding" at TV Heroes. Andrew Roberts, "Harding, Gilbert (1907–1960)" at ScreenOnline, British Film Institute. This page was last edited on 26 January 2019, at 23:21 (UTC).